With the introduction of the Biewer to America in 2003, there has been much speculation about its heritage. Werner and Gertrude Biewer had been raising and showing Yorkies for 20 years when—on January 20th, 1984—the first blue, white, and gold Biewer named Schneeflocken von Friedheck was born. This was the start of what is known as the Biewer breed. The Biewer is quickly working its way into the hearts of Americans everywhere. With its lighthearted, whimsical, child-like attitude, this tri-colored toy breed is gaining popularity with dog lovers everywhere. Equally as good with children as with other dogs of all sizes, the Biewer is a loyal and fast friend to all he or she considers part of his or her family. Although every dog has his own unique and special personality, as a breed, the Biewer is confident, happy, fun-loving, and even-tempered. Generally speaking, Biewers are not noisy or especially difficult in any particular way. The Biewer is the result of the constructive breeding of 3 or more breeds. 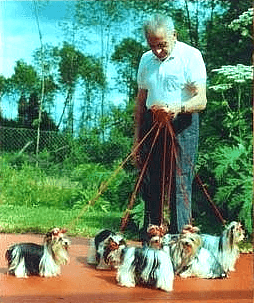 Mr. Biewer spent 5 years selectively breeding his dogs until he was able to establish and breed—true to a unique standard—the Biewer breed. The dogs were then registered as Biewer Yorkshire Terrier a la Pom Pon. 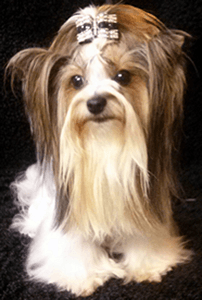 In 1989, when Mr. Biewer signed the standard for this wonderful new breed, it was that of the Yorkshire Terrier with the coloring being White-Blue-Gold. Mr. Biewer was not a man of many words, so the standard was short and brief. Mr. and Mrs. Biewer kept a close reign on the Biewer breeding programs in Germany, so their quality breeding dogs were hard to come by and quite costly. Mr. Biewer died in 1997, and his wife Gertrud Biewer discontinued their breeding program shortly thereafter. In November of 2007, Mrs. Biewer agreed to a meeting with representatives of a Biewer club in America, at which time she shared important information about the early development of the breed, and the trials and errors Mr. and Mrs. Biewer had gone through to reach their goal. The club shared what they had been doing since the arrival of the Biewers in America and the trials and tribulations they were going through. Great Scotts Biewers is proud to be taking an active part in the development of this remarkable new breed. The Biewer breed and Great Scotts Biewers welcome everybody to become involved in this exciting part of the Biewer history. Aside from the mandatory DNA testing required for breeding dogs, we are encouraging everyone to also have their Biewers vet checked before breeding so we will be better able to pair our breeders and ensure retention of maximum diversity. The International All Breed Canine Association (IABCA) has accepted the Biewer as a rare breed. We will be showing with IABCA under the standard that they have accepted for our breed and other breeders also exhibit with the American Rare Breed (ARBA) shows. 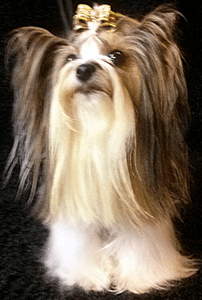 The North American Kennel Club (NAKC) also accepts Biewers in the show ring. My long-term goal is to take the proper steps to gain American Kennel Club (AKC) recognition so that we can exhibit as our own unique breed at AKC shows under the standard that best fits our exquisite Biewer.